Setting up your home office is an important task. As the place in your home that allows you to get away and get work done, you need to set it up the right way. 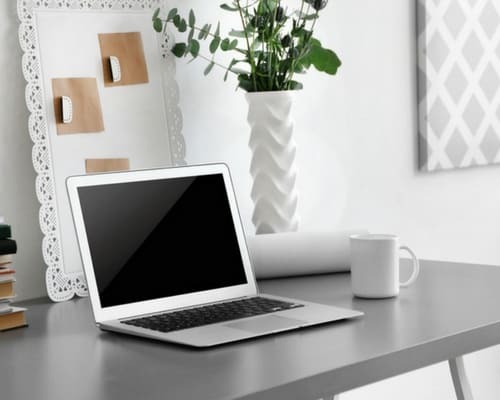 If your home office space doesn’t consider your working needs or can’t accommodate your tech equipment, you may find it difficult to work from home productively. But understanding what goes into creating a great home office can be a struggle. From planning your layout to equipping the space with the technology you need to work efficiently, there are a lot of factors to consider. At times, it can feel overwhelming and like you just can’t do it yourself. You don’t want to risk setting something up incorrectly or creating a hazardous environment. Hiring a professional to complete the tasks that you feel are too big for you can prevent you from running into trouble in the future. However, you don’t need to spend your entire budget on professional help. There are some instances where you can save money by installing equipment and items yourself. 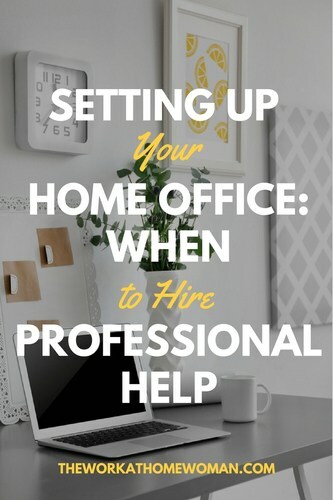 Let’s look at a few of the home office tech items you can buy and install yourself, and when to hire professional help. While your desk isn’t necessarily a piece of technology, it’ll probably be where much of your tech will sit. From your computer to your phone, your desk needs to adequately accommodate the tech that you’re going to have in your office. If you’re going to invest in a quality desk that can grow with you and your tech needs, you want to consider whether it’s adjustable. Having an adjustable desk allows you to do more in your office space. A desk that lets you stand can be beneficial for your health, considering sitting for more than 6 hours a day can increase your chances of death by 40%. You can also add different features, add-ons, or other components to ensure it accommodates your growing needs. However, if you purchase something cheap or you put it together incorrectly, it could end up damaging your gadgets — costing you a pretty penny. Because your desk is so important, you want to ensure it’s put together correctly. You don’t want to set up the centerpiece to your office only to find that it’s wobbly or doesn’t accommodate your tech the way it should. If you have the option of having a professional assemble your desk for you, you might want to take that route. If you’re working from home, you’re most likely working digitally. This means you probably have a lot of hardware you need to put in your home office. From your laptop to a desktop to a printer, each of these items is crucial for working remotely. Depending on what you do, you might even need more equipment than others. Luckily, computer equipment is becoming easier and easier to work with. Since just about everyone has been working on laptops and desktops for years, you probably know a thing or two about how to set up your system. Unless you’re purchasing an intense piece of equipment, installation usually only involves opening the box, plugging it in, and filling in some personal details. You can usually set up your computer equipment on your own. However, technology still isn’t perfect. When you’re trying to link your new Bluetooth printer to your laptop or your scanner isn’t working correctly, you might need to enlist a professional. You should usually have access to customer service representatives who can easily walk you through these challenges. When we think about the tech in our home office, we don’t usually think about what fuels it. The cables and wires behind the technology in our home office are incredibly important for ensuring everything runs smoothly — and preventing any fires or other problems. If they’re not the right kind or they’re not installed correctly, it could lead to a dangerous situation for you and your family. Many people choose to purchase their own cables because they’re cheaper. However, most people don’t know how to install those cables correctly. This can put both them and their families at risk for a variety of hazards. When you work from home, you don’t want to make your office a dangerous place. You should always have a professional install your home office cables. They have the necessary tools and experience to prevent hazards from happening. Plus, they can also guarantee that your cables are up to specific standards. When you spend most of your day in one room, you want to be sure it is properly lit. Your lighting will not only allow you to see your work better, preventing your eyes from straining to see what you’re doing, but it can also make it more enjoyable to be in your home office space. With more than 4 million Americans being visually impaired, making sure you have the right lighting is crucial. There are many ways to add light to your home office. From adding desk lamps or floor lamps to including some permanent fixtures, you need to consider what works best for your space. You’ll also want to look at how your lighting meshes with your other tech. You don’t want to spring for a new overhead light only to find that it casts a harsh glare on your computer screen. If you’re just looking to add some temporary lighting to your home office, such as desk lamps or table lamps, you don’t need a professional. However, if you’re looking to add permanent fixtures or hide the lamp cords in the wall, you’ll want to consult a professional to help you out; it can quickly become a huge job. If you work from home, WiFi is an absolute necessity. As the primary point of contact for your office, you need to have WiFi on which you can rely. Slow, spotty, or difficult to connect to WiFi isn’t an option when you have a home office. In older or bigger houses, you may find that it’s harder for your WiFi to make a reliable connection in every room. If your home office happens to be in a location that doesn’t get a great signal, you may need to add another modem or an extender to get an additional boost. Both modems and extenders are easy to purchase and set up. In most cases, they involve taking them out of the box, plugging them in and creating a password. Like your computer equipment, you shouldn’t need more help than what you could get from a customer service representative. When setting up your home office, you want to be sure you get it right the first time around. While it can save you some cash to do everything on your own, it also puts you at risk for making mistakes that could end up costing you more time and money in the long run. Getting everything up and running the right way the first time allows you to sit down at your desk and get going. Knowing when to hire professional help, can help you save time and money. If you’re not quite sure how to do it yourself, it’s best to hire an expert. Do You Need a Business Phone for the Home Office? This is great! Getting ready for retirement or even just making a home office is a great way to get organized and just figure out you and what you want do! For your mental health it is great just to have your own space and get away from either your kids or spouse.